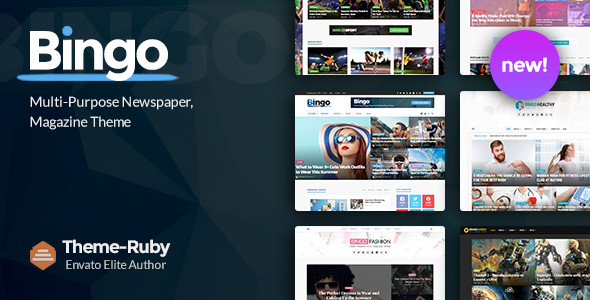 Bingo – Multi-Purpose Newspaper & Magazine Theme Created by Theme-Ruby. This templates have specific characteristics, namely: Bingo is a Multi-Purpose Newspaper, Magazine WordPress Theme best suited for sites that deliver news about Technology, Fashion, Sport, Video, Healthy, Travel, . You can use this Bingo – Multi-Purpose Newspaper & Magazine Theme on WordPress category for ajax, blog, fashion, flexible, healthy, magazine, newspaper, personal, professional, review, sport, technology, video and another uses. BINGO is optimized for speed. This is a fast magazine/blog theme of us. All the queries to be optimal, all the scripts are profiled and modified to make your website run at top speed. Multi-Purpose, modern and beautiful design can be used for many types of news, magazine and blog websites. Support Google fonts, over 700+ fonts, can be changed any font types as font-size, line-height, letter-spacing, font subset.. from Theme Options panel. Translation ready with POT file, compatible with translation plugin: Loco translate. Custom CSS via Theme Options panel. Human time format with on/off option. Show/hide almost elements of blog layouts. Excerpt length control for list, grid and classic layouts. Scrolling animation with on/off option: fade, zoom, fade from the bottom animation. Ruby Page Composer: help you easily to build creatively page. Ruby Page Composer is a simple, flexible, lightweight and easy to use page builder to help you create page layouts. Ruby page composer supports a lot of block layouts so that it make Bingo is very flexible and you can create any layout as you wish. Advanced Blog Layouts: BINGO supports a lot of layouts for the blog page, with Featured section include: sliders, carousel, grid layout. That allows you to create a beautiful, clean blog without any effort. Theme Options: BINGO comes with 100+ options, hope to help you customize any element of your website via Theme Options panel or Live Customize page without code knowledge. Page/Post Options: BINGO support individual options per page or post, meaning it only affects the page or post you set them on. It will override theme options which allow you to have a unique page or post outside of your global settings. Video Format: Youtube, Vimeo, Dailymotion and Self-Hosted video. Audio Format: Soundcloud, Mixcloud, and Self-Hosted audio. Primary Category allows you can set the main category for each post. Related filter and ajax load. On/off option for most elements in the single post. LIKE/TWEET/G+ buttons with on/off option. Advanced Shortcode: BINGO supports some useful shortcodes to help you can build content for your website. Button shortcodes: default, round, and 3D style. Drocap shortcodes: default and background style. Built-in Review System: allow you to provide meaningful product feedback with review/rating systems. Advanced Category Options: BINGO supports powerful options for all categories and individual category, that allows you to change any category page you wish. 7 category layouts, options can be applied individual per category. On/off the classic layout for 1st posts in the blog listings. Category sidebar position: right, left, and none sidebar. Column mega menu design for large menus. Category mega menu option lists the latest posts from each category with on/off option and ajax pagination. top bar with on/off option. 9 Different Header Style: allow you to create a unique header for your website. Multiple Sidebars: BINGO supports multiple sidebars, It means you can create unlimited sidebar sections and can assign it to any pages, posts on your website. Popular Plugin Design Integration: BINGO is compatible with almost plugins of WordPress and integration and support layouts for popular plugins. Compatible with WooCommerce and integrated design. Compatible with Contact Form 7 and integrated design. Compatible with Contact Ninja and integrated design. Compatible with MailChimp for WordPress and integrated design. Compatible with Yoast SEO Plugin. Compatible with All In One SEO. Compatible with WP Super Cache Plugin. You can post your re-purchased questions here, we will answer as fast as possible. For further information and detailed instructions, contact us via the support tab of this item. ------Version: 1.0 --------- Initial release.